It's About TV: Mike Connors, R.I.P. / Barbara Hale, R.I.P. For those of you who hoped this year would be better than last year, so far your prediction isn't doing very well. It seemed almost ridiculous that in the course of three days we'd hear of the deaths of three of television's stars from the past (plus John Hurt; although his fame rests mostly from movies, we can hardly forget his television appearances, from I, Claudius to Doctor Who). 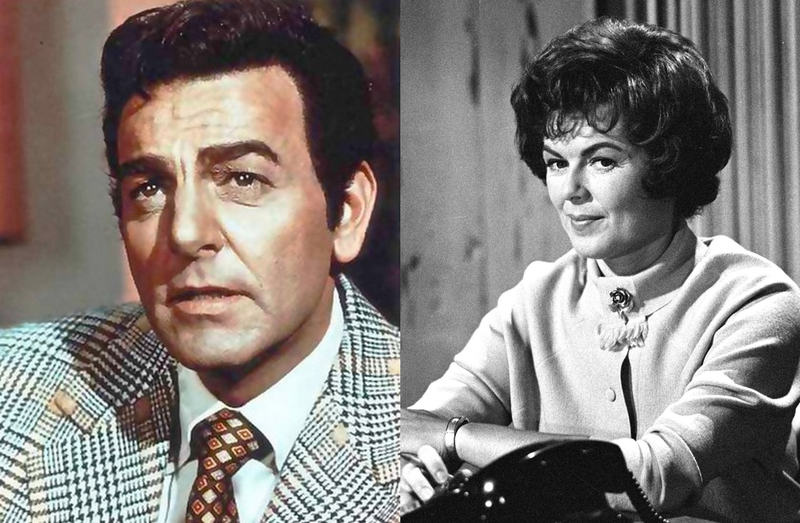 If you think about it, though, it's fitting that Mike Connors and Barbara Hale would die at more or less the same time, for the characters which brought them the most fame were alike in many ways. Joe Mannix, Mike Connors' most enduring character, was an archetype, the last of a kind - the hard-boiled private detective. Connors admitted as much, saying that Mannix really was a throwback to that earlier time, an impostor in modern clothing. In that first season, Mannix worked for a company called Intertect, a large detective agency that used advanced (for the time) computer technology to aid its agents. That wasn't Mannix's style, though, and by the start of the second season he'd moved out on his own, which is how most of us remember him. We also remember him for his essential humanity, his dedication to the truth and to obtaining justice for his clients. It's been said by others that these qualities, and the warm way Connors was able to bring them to life on the screen, which made Mannix such a hit with viewers. Mannix is a dependable hero, through and through. It was that same dependability and trustworthiness that made Della Street, the iconic secretary to Perry Mason, such a memorable character. Della wasn't always sure of the direction her boss was taking, but there was never a doubt about him in her mind. Look at the hours she worked - late almost every day, well into the night (or early morning) during big cases, even going into the field at times to deliver the vital information Perry needed to win his client's freedom. They are so much a team - it's almost impossible to envision Perry without Della, which is why the very premise of the revival movies - in which Perry steps down from a judgeship to defend Della on a murder charge - was ridiculous. Do you think Della would ever have let Perry go off to become a judge without her? Do you think Perry would ever have taken that appointment without bring Della along? Preposterous. Della is a product of her times as well, the dedicated secretary that feminists might have scoffed at, putting her ambitions aside in service to her man. Could Della have been a lawyer in her own right? Perhaps; she certainly learned enough law working all those years for Perry. But that wasn't the point. Perry Mason was a great man; who among us would not have given something to work with and alongside such a man, dedicated to the truth and to obtaining justice for his clients. Likewise, Mannix's relationship with his version of Della, Peggy Fair, showed not a employer-employee duo, but a partnership on both a professional and human level. They were object lessons in the dignity of the workplace, and that's something increasingly difficult to find today. Were either of these characters well-developed? Probably not in the way we'd think of it in today's serialized, soaped-up television. But in each case, it was the actor that brought an extra dimension to the character, a likability and honesty of portrayal that endeared them to viewers then as well as now. We loved them as characters, we miss them as real people. In this day and age, that's a rare combination - but then, Mike Connors and Barbara Hale were rare indeed.